Will the Markets Explode One Last Time? Look… the crash of a lifetime ahead is inevitable. But, it’s looking increasingly like we’ll see a last-hurrah short boom of a lifetime first. Something I like to call the Dark Window because it’s unexpected and most miss it. Most analysts see a deep correction here and then modest gains and only slight new highs in 2019. Jeremy Siegel, the perma-bull, sees a “good” 2019 for stocks if we don’t have a recession, which neither he or I think is likely in the near term. By good, he means a 5% to 15% rally. But 15% wouldn’t even retest the markets’ recent highs. In the January Boom & Bust newsletter that we published yesterday, and the Economy & Markets email I plan to send you tomorrow, I show the most bullish scenario for the Nasdaq in 2019. You’ll be surprised. 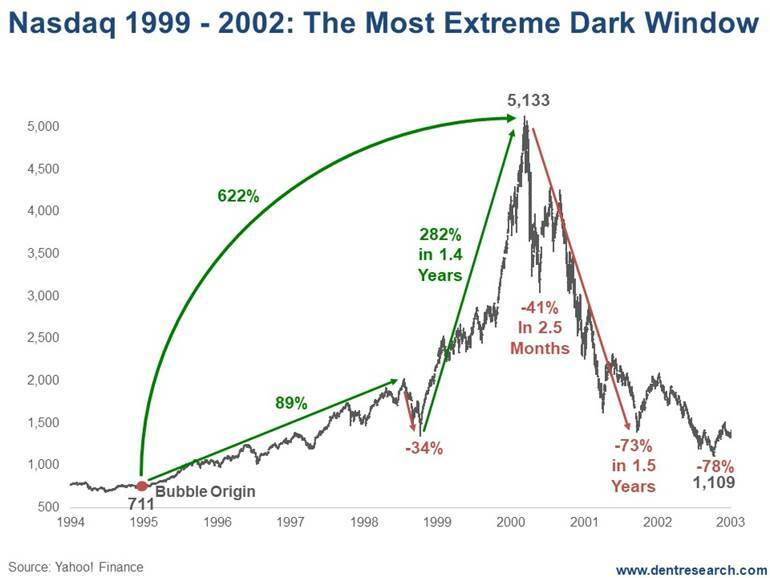 The whole bubble from late 1994 into early 2000 was up 622% in 5.2 years; then investors endured a 78% crash in 2.6 years, taking the index back near to its bubble origin, classic for my bubble model. Look at that 34% flash crash in mid-1998. Painful. Ten percent more painful than the current crash thus far for the Nasdaq, at 24%. That didn’t occur in 1929 or any other bubble of the last century. The only other time we’ve seen that was in the Tulips bubble and the South Seas final run into 1720. And from the looks of the way markets are behaving now, there’s a good chance we’re about to see a similar Dark Window open again. This means there’s the chance to make unimaginable gains before that inevitable crash sets in. And like I started out today by saying, there WILL BE a soul crushing crash, very likely worse than what we saw on the Nasdaq into 2002 and more like the Dow from late 1929 to 1932. When the fat lady eventually stopped singing in early 2000, Nasdaq investors lost 41% in just 2.5 months (one of the biggest reasons you shouldn’t wait until a bubble is definitively over before you try to get out). Within a year and a half, they’d given up 73%! By the time the bottom was in, they’d bled to the tune of 78%. And this wasn’t even the most extreme crash investors have had to endure because it didn’t happen into a “Great Depression” like the next crash will and 1929 to 1932 did. Still, it was by far the most extreme for that final Dark Window, blow-off rally. And if this Dark Window occurs again exactly 90 years after the infamous 1929, on my most powerful Bubble Buster Cycle, even the most bullish forecasters on Wall Street won’t see it coming. Tomorrow, I’ll show you how high the Nasdaq could go this time around, if we don’t break some critical support levels in the next several weeks.